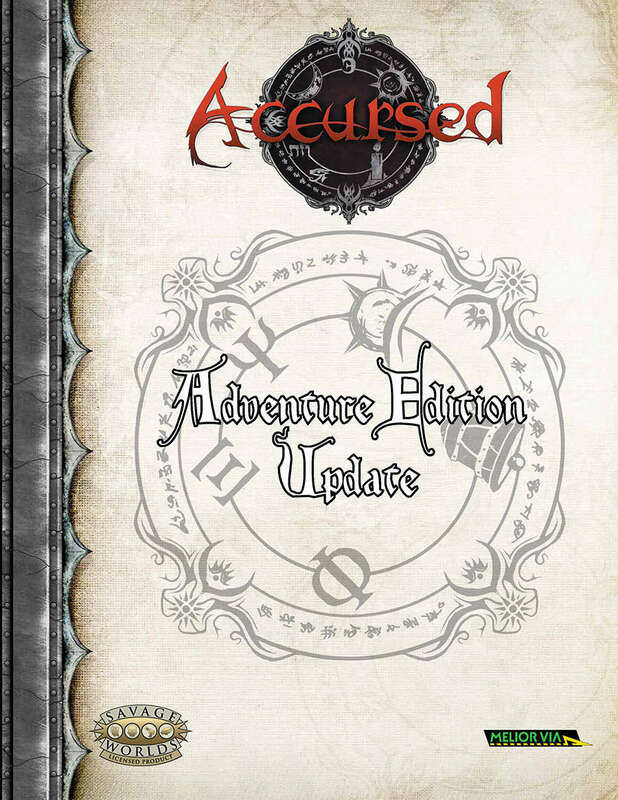 The Adventure Edition Update for Accursed is now freely available for download from DriveThruRPG. This is just a bare-bones document, to help players who want to use the new edition of Savage Worlds Roleplaying System with their existing materials. We're using this guide to create a Jumpstart, which we hope to have available soon! Over on their site, Pinnacle Entertainment Group just announced the formation of a Savage Worlds Adventurer Guild. If you haven't heard, click that link and check it out, then come back here, we'll wait. 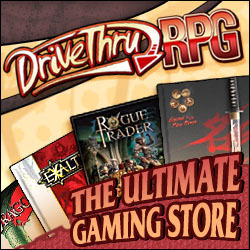 The long and short is that this program provides a way for anyone to publish and sell game materials using the Savage Worlds system on DriveThruRPG. We think that's a great idea, but the system doesn't provide a built-in way for people to publish materials for settings that are already out there. 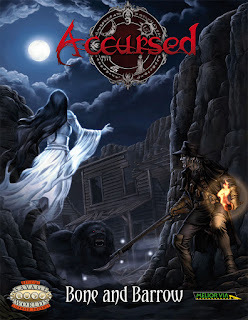 We also suspect that there might be a few folks who dig Accursed or The Thin Blue Line and would like to be able to publish their own creations for our settings. This might include things like monsters, NPCs, adventures, or even entire campaigns. We'd love to see that happen. If you're interested in writing for Accursed or The Thin Blue Line materials for SWAG, drop a line to info@meliorvia.com and we'll get you straightened out. Happy Holidays, to all of our readers. An idealistic young girl sets out to prove that the celebration of Evergreen Night is for everyone, even the reclusive and infamous Frau Pechta. The Penitents are asked to bring the girl back to her family before Frau Pechta’s inhuman hunger brings a grisly end to the holiday! Can the Accursed handle a sugar-spun stronghold, candy-frosted banes, and the spirit of the season? 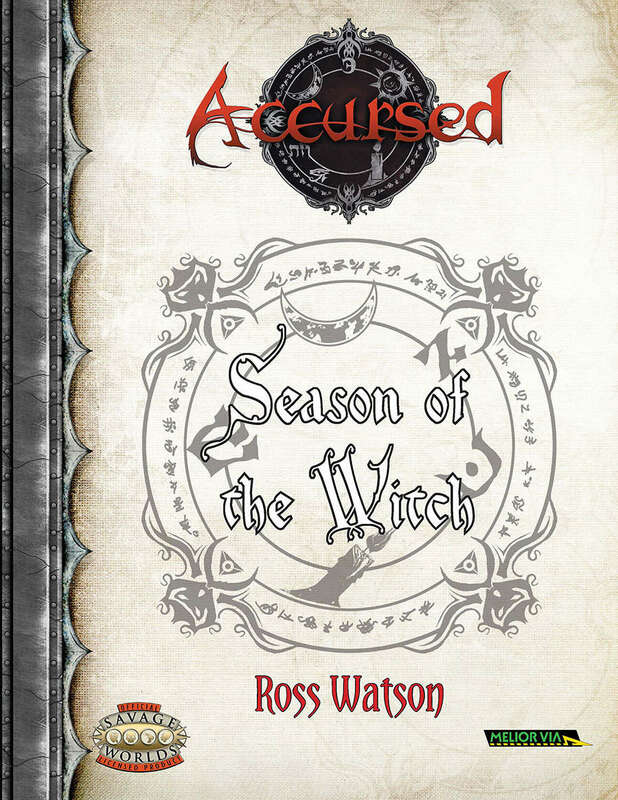 Season of the Witch is now available from DriveThruRPG. We've decided to make it a Pay What You Want title, with a suggested price of $1. If you're looking for a last minute gift, all of our digital releases are now 25% off through the end of the 2016. When checking out, you can select an e-mail to send the PDF as a gift to a fellow gamer. Print / PDF combos also include a discount on the digital component. Note, though, that at this point, the print on demand copies will not arrive until the new year. Of course, if Santa gave you a little extra money this year, now's the perfect opportunity to flesh out or even complete your collection of any of our lines! We have a number of different irons in the fire at the moment, and we wanted to update you with our progress. We've just released a new 1-sheet adventure, with the help of one of our World of Morden Kickstarter backers. As the heroes travel through the Outlands, they come upon a small village, which seems to be in the midst of serious construction. They soon learn that a band of Accursed recently visited the town, and demanded that the refugees who settle it leave. As it turns out, those Accursed dwelt here, long before the Bane War began. Needless to say, they're unhappy about the refugees stealing their homes and land. The Witchmarked heroes must decide which party is in the right, and try to resolve their conflict, lest blood be shed between those who still oppose the Witches. DriveThruRPG is in the process of updating the printing process used for their standard printing. The change is focused upon the weight of paper used for the printing process. They've switched from a 50 pound weight to a 70 pound weight. The newer paper makes the books a little bit thicker and a little bit heavier. It also does a somewhat better job of absorbing ink, and, since it's thicker, it's more difficult to see artwork or text on the other side of a page. We've completed the transfer process, designing new covers for all of our standard printing books to be compatible with the thicker pages. We've also ordered proofs to confirm that the pages look OK. The new books are more expensive to print, but we've chosen to keep our pricing the same. Any books ordered from Melior Via on DriveThruRPG going forward will use the heavyweight paper. So, we just had to order a whole bunch of proof copies of our books. However, we don't maintain an inventory of our books. So, we don't really want to leave those sitting around. After a bit of thought, I've decided what to do with them. We want more reviews of our products. We're pretty sure there are at least a few folks out there who would like printed copies of our products. You'll need to demonstrate that you're the author. Having a name or e-mail address that matches the reviewer's name is a good start. This will be first come first served. We aren't printing extra copies of books for this at this time. Due to the cost of postage, we're restricting this to people with a US mailing address. It is cheaper for us to print copies outside of the US and mail them than it is for us to post books internationally. If this goes well, we'll consider running a future contest for international reviewers. Note that these do need to be new reviews. Once you've posted them, please drop a line to info@meliorvia.com with a link to the reviews. We know that many of our supporters would like to see more 1-sheet adventures released. We're considering running a Patreon campaign to insure a flow of monthly adventures. This could also offer an opportunity for supporters to have a say in which settings we support, have custom artwork created to be featured in adventures, and even to play in games with our creators. If this sounds like a good idea, please let us know that you'd be willing to support it. April Updates and Releases - No Fooling! We've wrapped up the series of World of Morden ebooks created through our January Kickstarter, and we wanted to make sure that everyone was aware of the new products. We've previously talked about our releases of Frost and Fang as well as Science and Sea. Bone and Barrow is the final ebook in that series. Cairn Kainen and the Outlands were the first casualties of the Bane War. Neither could mount an effective defense against the Witch Armies, though for very different reasons. In both cases, their early collapses provided the Witches with the resources they needed to push the battle into Morden's other surviving nations. Now, both regions suffer under tyranny, long after the Witch Council dissolved. Hecate's Oubliette remains in the foothills of the Darkwall Peaks, and her banes prowl the Outlands. The Morrigan has made a new home in Blackroot Wode and collects a steady tithe of new souls to feed her cauldron. Bone and Barrow provides additional information about the nation of Cairn Kainen and the Outlands that provide a barrier between the Darkwall Peaks and Morden's more stable nations. It includes a broad range of different adventure hooks for GMs and players looking to explore these specific regions. It also introduces new banes as well as Hindrances and Edges specific to these cultures. Bone and Barrow is available for $6 from DriveThruRPG. An important note on this release is that Sean Tait Bircher was so excited about his work on this that he wrote more than would fit. He's chosen to make his extra writing freely available on his blog. With the last of the ebooks complete, we can now also offer the print compilation of all four volumes. 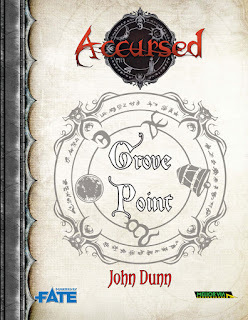 Accursed: World of Morden compiles the PDF releases from Sand and Stone, Frost and Fang, Science and Sea, and Bone and Barrow. It's now available in several different print formats directly through DriveThruRPG, starting at$35. In the World of Morden, the forces of evil triumphed. The six great nations lost the Bane War to the Witch Council. Their armies were shattered. Now, Witches rule the land, but their Grand Coven has been sundered. The remnants of their massive army include captured citizens of the conquered nations who fought as the Witches’ shock troops. These soldiers became Accursed. Witchmarks burned into their flesh and souls transformed men and women into monstrous forms. Unable to return to their former lives, the Accursed wander the land, giving aid to those in need in an attempt to atone for past sins. As part of the World of Morden project, we created two new maps for Accursed: Sand and Stone. This required us to do a new layout of the ebook. When we did that, we ended up with a little extra space in the Hebron chapter, which we used to add another bane from the Crone's witchline: the Many Header. Previous buyers can download the new version from their DriveThruRPG library. Other interested customers can obtain Sand andStone for $6 from DriveThruRPG. We needed to add Ill Omens as a print product to DriveThruRPG in order to fulfill it to customers in our January Kickstarter. We've chosen to leave it available for purchase their as well for customers unable to obtain it through traditional channels. Ill Omens released in the summer of 2014, as a compilation of all of the adventures that we had released in PDF up until that time. It's now available for $20 on DriveThruRPG. Melior Via is participating in a charity bundle organized by Fainting Goat Games. The bundle includes more than $200 worth of RPG ebooks in exchange for a donation of $20. All proceeds go to the Paws and Stripes charity. They're an organization devoted to training and providing service dogs to veterans in need of assistance. Here's the direct link to the bundle: Paws and Stripes Bundle on RPGNow. Ross continues to work on a novella for release in late 2016 that was funded by the January Kickstarter. We also have two short adventures that are in development in conjunction with a couple of our Kickstarter backers, which we expect to release this summer. We're still struggling a little bit with the time change here, but we've had a few different things happen, and we wanted to share them with you. Our second World of Morden Kickstarter ebook has now been released. Backers should already have a coupon in their inboxes, and the PDF is now available for everyone on DriveThruRPG. Manreia did not suffer any battles within its borders during the Bane War, but the nation still suffered grievous losses. She sent many soldiers and vast stories of supplies to aid the Army of Light in its battles. Since the war ended and Manreia surrendered, she has had to struggle under the Witches' tyranny, living in a turmoil that even Manreian ingenuity cannot overcome. Refugees who left Manreian camps often boarded ships that carried them to the islands of the Discordian Sea. Most met with disaster, but a few have managed to survive on one of the many islands. Their lives are little easier than the ones they left behind, but at least they are less likely to directly encounter banes. Science and Sea provides additional information about the nation of Manreia and life on the Discordian Sea within Accursed's setting of Morden. It includes a broad range of different adventure hooks for GMs and players looking to explore these specific regions. It also introduces new banes as well as Hindrances and Edges specific to these cultures. For anyone who didn't back the Kickstarter, the ebook is now available for $6 in PDF from DriveThruRPG. Melior Via is currently participating in the DriveThru GM's day sale as well. All of our older products (IE, before Frost and Fang) are now 30% off. The Witchmarked heroes discover a village in the Outlands destroyed by banes harboring a lone survivor. They must uncover the cause of the damage, rescue any other survivors, and try to put a stop to the banes responsible. In the process, they may uncover a new plot that the Dark Queen, Hecate, has already put into motion. Dark Queen's Gambit is a 1-Sheet style scenario that focuses on the adventures of a band of Witchmarked heroes in the Accursed game setting. The adventure may be played as a standalone, or it may be used with the Plot Point Campaign included in Accursed. The adventure features brief scene descriptionss, with necessary game mechanics and opportunity for tasks that can be resolved in a variety of ways. This ebook is now available for $1.25 in PDF from DriveThruRPG. It was written by Richard Woolcock of Savage-Stuff! John recently started dabbling in the 5th edition of the world's oldest RPG. He wasn't entirely satisfied with one of the mechanics, and decided to provided an alternative to the Inspiration system. Luck points aren't anything revolutionary, but they're a different approach that offers a little more narrative control for both the the PCs and the GM. A brief PDF is freely available and all of the game content is available through the OGL for re-use.